Can the UN Security Council help prevent conflicts? 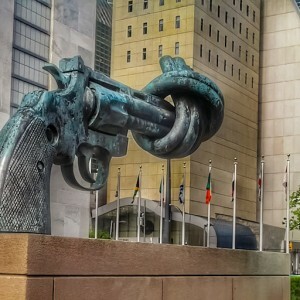 The international community must develop effective conflict prevention mechanisms to be able to sustain peace. This report reflects on the Security Council’s current and potential role in conflict prevention, and offers recommendations for policy and specific responses. It also includes an analysis of the role of countries of the Global South in the Council, and expectations for a new leadership at the United Nations. Gustavo de Carvalho, a Senior Researcher at the Peace Operations and Peacebuilding Division at the Institute for Security Studies (ISS) in South Africa, has extensive experience in capacity development, policy support and research initiatives related to peace and security issues in Africa. Gustavo holds a bachelor’s degree in international relations from the University of Brasilia, and an MSc in African studies from the University of Oxford. Adriana Erthal Abdenur is a fellow in the Peacebuilding Division of Igarapé Institute in Rio de Janeiro, and a senior post-doctoral researcher at the Centro de Pesquisa e Documentação de História Contemporânea do Brasil (CPDOC) at Fundação Getulio vargas in Rio de Janeiro (FGv-Rio) through a grant from the Brazilian National Research Council (CNPq.). Her work on armed conflict prevention and resolution focuses on the roles of the UN and regional organisations. Adriana holds a bachelor’s degree from Harvard University and a PhD from Princeton.